MINI has uncovered a larger and more practical Clubman at the Frankfurt Motor Show. 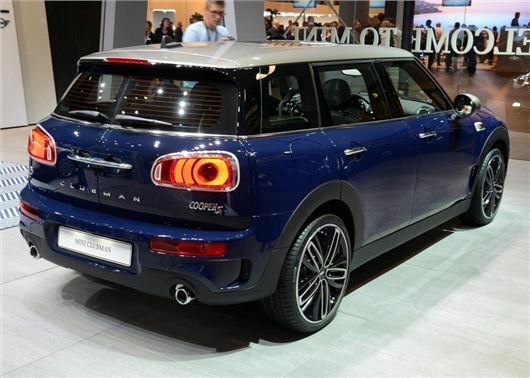 The new MINI will be priced from £19,995 and feature a longer cabin with 360 litres of boot space. The Clubman has a smaller engine line-up than the hatch, with three choices, which starts with entry-level 1.5-litre petrol. The compact petrol will produce 136PS gets from 0-62mph in 9.1 seconds, with emissions of 118g/km and economy of 55.4mpg. The 2.0-litre, 150PS Cooper D diesel is expected to be the most popular model, thanks to emissions of 109g/km and 68.9mpg economy, while 0-62mph will take a respectable 8.6 seconds. The range-topper will be the 2.0-litre petrol with 192PS, which will power to 62mpg in 7.2 seconds. However, there's a penalty in terms of economy, with 134g/km of CO2 and 45.6mpg. All three engines are available with a manual or automatic transmission. MINI is hoping that the new Clubman will rival the Volkswagen Golf. As a result the Clubman will be one of the largest MINIs ever built, stretching more than four meters in length and close to two meters in width. However its additional length over the hatchback doesn’t go to waste – the Clubman has some very spacious rear seats. Fitting a couple of adults in is very easy indeed, even with taller occupants up front and a sunroof installed. Access is good too, thanks to full-sized, wide-opening rear doors. Typically MINI models have more or less the same dashboard layout from car to car, but the Clubman is different. The arrangement of the dashboard, centre stack and centre console are unique to the Clubman, yet they still retain an immediately recognisable MINI identity. The dashboard top is cleaner and simpler, plus it has unique square air vents and a body-coloured surround. The air conditioning controls are housed in a neat, classy recess in the centre stack and the centre console is neatened up by a standard-fit electronic handbrake. The rear doors are still side-hinged and split down the middle, like in the previous Clubman, but MINI has added a two layer floor in the boot. Plus there are 60:40 split-folding rear seats. Prices for the Clubman start at just under £20,000, but opting for a Cooper D diesel bumps the price up to £22,265, while the Cooper S is £22,755.